The Center collaborates with reputable research laboratories and universities in Europe, the United States, Japan, South Korea, and Australia. Both sides benefit by participating in joint projects and exchanging data, results, and staff: the Center gains access to state-of-the-art research technologies, while the research labs can access the Center’s genebank and tap into our global network of vegetable breeding expertise in different climate zones. These successful partnerships are reflected in the Center’s varieties and breeding lines, which cope well with tropical climate extremes, have good resistance to major pests and diseases and increase the incomes of smallholder farmers and the nutrition of consumers. Agriculture ministries and National Agricultural Research and Extension Systems (NARES) are essential partners for the Center. NARES use World Vegetable Center lines in their research and breeding work and assist in the release of Center-improved varieties. They provide the Center with regional information on vegetable production, including major pests and diseases and the preferences of local consumers and farmers. Through regular interactions with NARES the Center gains a better understanding of what smallholder farmers need, and together both partners can develop more coherent strategies to meet those needs. 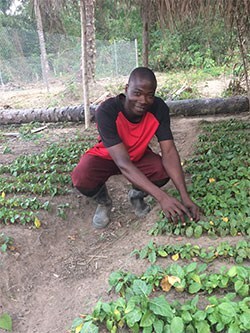 Civil society organizations (CSOs) and nongovernmental organizations (NGOs) play a crucial role in disseminating new varieties and information on best practices for vegetable production. These organizations are well connected locally and often know farmers on a personal basis. These organizations often conduct the Center’s farmer training programs to promote the adoption of improved varieties and production practices. Active collaboration with the private sector ensures the Center’s research can reach a broad base of farmers. Seed companies benefit from access to the World Vegetable Center Genebank; they can obtain the Center’s breeding lines to use as parent lines or as a source of traits for backcrossing programs. The companies’ strength in commercial seed multiplication and marketing helps to rapidly spread beneficial research outcomes to farmers.